Tomorrow, five students from the Pittsburg Unified School District in Contra Costa County will join First Lady Michelle Obama and students from schools in Arizona, Ohio and Washington D.C. to harvest vegetables from the White House Garden and work with chefs to turn them into a healthy meal. Pittsburg’s students are attending the event in recognition of the Farm to School programs the district has implemented. The district now has eight school gardens, incorporates local produce in school cafeterias, and provides nutrition education in the classroom as well as after-school programs. The students visiting the White House all come from Pittsburg’s Willow Cove Elementary School. 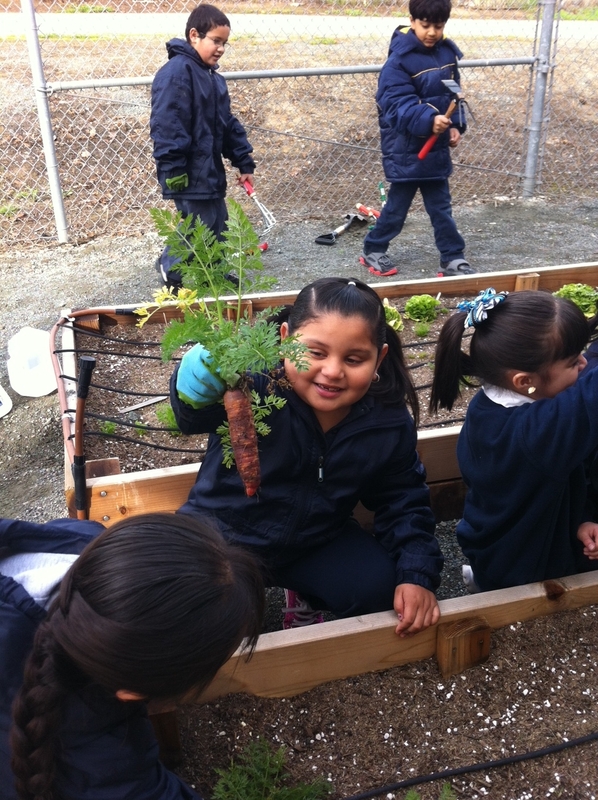 The school’s garden began last year, when second-grade teacher Elba Ramirez requested milk crates to start a small classroom garden. Instead, district child nutrition director Matthew Belasco offered to build a larger garden with raised beds. Ms. Ramirez and her students planted and cared for the garden throughout the year and then harvested the vegetables, which were served in the cafeteria. CDFA’s Office of Farm to Fork has been working closely with Pittsburg Unified’s Food Service Department to develop these programs and incorporate more locally grown food in district cafeterias. The office is also working with Pittsburg and surrounding school districts to directly connect them with nearby farmers to provide local food. This entry was posted in CA Farm To Fork website on October 13, 2014 by California Farm to Fork.